Don’t let these common resume mistakes or outdated ideas hold you back. So you’re just out of college. You’re young, you’re educated, you’re motivated, you’ve got a strong back and a willing spirit and you’re ready to prove that you can do most anything if you’re just given half a chance. But in spite of all of that you just can’t seem to get employers to give you the time of day, let alone an interview. Now with unemployment levels still at record highs, and the job market flooded with out-of-work professionals more experienced and more connected than you, it’s more important than ever to stand out with a cutting edge resume that’ll catch the employer’s eye and land you a fighting chance at a job. Take it from a vocational case worker, whether you’re still out there looking for work, or if you’re working under the constant threat of “last hired, first fired” (an issue in these tough times more than ever), it’s time to take a hard look at your resume and make sure you’re avoiding these rookie mistakes. That problem might seem laughable to a lot of recent graduates, but the simple fact of the matter is that after your 50th rejection letter (if you hear back from the company at all), there’s definitely going to be a strong temptation to try to give your resume some bulk. You’ll probably try to pack in relevant coursework or list out every detail of every job you’ve ever had, related or not. “Not enough experience” is the issue most of us are going to be cursed with, and we’ll put down just about anything to convince a potential employer that this isn’t the case. As understandable as that is, it’s still going to shoot you in the foot. Regardless of whether the information in your resume is just fluff or, for a fortunate few of us, genuine, if your resume’s too dense , or worse yet, stretching on for over a page, it’s almost certain to be thrown out. What you need to understand is that, other than the largest corporations, the vast majority of companies do not have a dedicated HR staff. That's to say, whoever is reading your resume is probably taking time away from his or her regular duties to do so. Whether it’s the office manager or the owner or the crew leader, they’ve got more pressing tasks than wading through forty or fifty resumes. Trying to pack your resume full of every qualification you have is only going to make your relevant skills that much harder to find. Take it from someone who deals with the hiring process for a living – the employer is going to spend around a minute – at most – looking over your resume. Assuming 60 resumes make it to their desk, are they really going to take an entire hour away from his actual tasks? It just isn’t going to happen. You've got to make the process as easy as possible for whoever's reading it to find the information you want to be putting out there. Hack and slash your resume down to the bare basics of what the job entails. Don’t have all of the experience or skills needed? Then leave them out and spend what little space you’re limited to showcasing the ones you do have. Any hiring manager worth his salt can smell BS from a mile away – it’s always better to show inexperience than to exaggerate. Keep in mind that the ideal resume should never be more than a page long, and always clear and bare enough to make your relevant information readily visible. Now you're going to want to cut down your resume, not water it down – there's a difference. 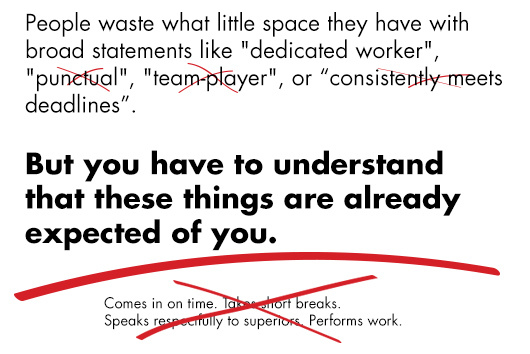 In my line of work I am constantly seeing people waste what little space they have with broad statements like “dedicated worker”, “punctual”, “team-player”, or “consistently meets deadlines”. You might think that phrases like these will assure the employer of how professionally-minded you are, but you have to understand that these things are already expected of you; there's no need to put them in there. Trying to sell yourself on the merit that you show up to work on time is like trying to sell a car on the merit that it has wheels. Even “computer literate” and “Proficiency in MS Office Applications” are overwhelmingly becoming expectations that every company has of their prospective employees. Put yourself in the employer’s position and imagine you’re hiring for an opening. Who are you going to offer an interview to – the applicant who checks off all the requirements or the applicant who checks off all the requirements and speaks Spanish? Instead of trying to convince the employer that you meet the most minimal requirements of the job, make sure your resume is showcasing what makes you unique. Again, the purpose of a resume isn’t to simply show that you’re qualified but that you’re more qualified than your competition. Languages are a huge selling point here. While Spanish and French are typically the heavy hitters, even being conversational in some obscure dialect is going to be something the employer appreciates having in their pocket if the need ever arises. Any form of maintenance ability is going to likewise be a huge pull. Regardless of whether your collar’s blue or white, being able to perform even the most basic kind of troubleshooting on the machinery you’re working with – be it a scanner or a scissor lift- is certain to catch the employer’s eye. Want to make yourself really useful to any employer? Look into becoming a notary public. Same goes for any kind supervision or training experience. Leadership and teaching skills are one of the few truly universal perks out there. You naturally don’t want to look like you’re here to disrupt any teams or take anyone’s job, but an employer is always going to like knowing they can utilize you to show a new guy the ropes or call on you to take control of the situation if the manager’s ever delayed or out sick. Let’s jump back to the car illustration. Imagine that you're looking to buy a car and you've got two options. One car is listed as getting 20 miles to the gallon while the other is just listed as having “good fuel efficiency”- which are you going to choose? Twenty miles to the gallon isn't the greatest fuel economy out there, but each and every time you're going to pick it over the car which doesn't give you an exact number. It's a classic case of “the devil you know”, and it applies just as much to the workplace. No competent hiring manager is going to risk company time, money, and manpower investing in someone they’re unsure about, and again, a staggering number of resumes floating around out there are nevertheless making this error. If you want to make it to that interview, you’re going to need to spell out exactly what your capabilities are. If you’re trying to land a job as a waiter or a host, break down for the employer the average number of customers you had to deal with every day. If you’re a customer service rep, how many calls did you have to deal with? How many walk-in customers? Aspiring social workers: How big of a caseload did you have to handle? How big of a facility did you clean? How many bedrooms can you turn down in an hour? How many words per minute can pump out? Don’t leave anything to the employer’s imagination; they’re going to err on the side of caution and assume the worst. Yet again, being exact and specific is all the more vital in today's job market where you're going to be competing with folks who've been in the field for ages. If you want to get the edge over them it's going to boil down to marketing yourself better. You see this on a lot of older resume formats, and in their defense once upon a time an objective was as much an expected part of the resume as the work history. And while pretty much every template on the internet (heck, plenty of articles on writing resumes too) suggest having one, in today's job market this just isn't the case. Let's consider what the presence of an objective on your resume is doing for you. Maybe, just maybe, if you’re the only person in the state capable of meeting the requirements of the position an objective would be acceptable, but even then it’s a waste of valuable space you could dedicate to your accomplishments or abilities. Unless you’ve got employers knocking down your door to beg you to come work for them there’s just no sense in taking the risk. Instead jump back to what you’re intending to do for the company. If you are going to list an objective then make sure it’s tailored to the specific company you’re applying to, and list off what you will be doing for them. Cutting cost, maximizing efficiency, reeling in new customers or retaining the ones they have – if you’ve got to have an objective it should be centered around one of these. And if you’re going to make one of these promises you’d damn well better deliver on it. Pumping out application after application and getting nothing back, it can be easy to start assigning blame to the employer. We assume that the issue isn’t with us, it’s with them. We know we could master the job, it’s just that nobody’s giving us a fair chance here. Let’s be clear on this, your resume is not some holy text delivered from on high. Not matter how closely you follow these instructions or perfectly you showcase your work history, there’s no perfect format or formula which is going to land you every job you apply for. If your primary focus is on anything but getting that interview, then you’re doing it wrong. 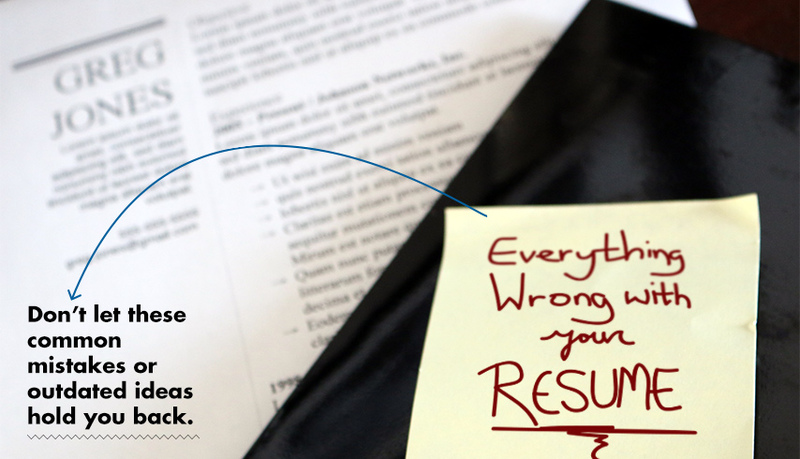 No matter how great your resume gets, never make the mistake of getting attached to it. If you’re not ready to scrap it all at a second’s notice then you’re not ready to work. Always keep this simple truth in mind: your resume is nothing more than a scrap of paper designed to get you into an interview. Most jobs are going to expect a resume similar to what you’re used to creating, but you should never become reliant on it. If writing “I once beat a bear to death with a phone book” on the back of a concert flyer gets you an interview, that was the correct resume to use for that position. Will most employers accept that? Of course not, but if you think that one employer would call in you in over it, then go for it. If it works, it works. No matter how many “no’s” you get from an employer, all you need is one “yes”. Go out there and get it. Get a head start: Primer has 19 free resume templates available in different formats and styling. Gordon Brown is a former ex-pat recently moved back to the US from the Middle East. He spends his time working as a vocational counselor and downing more energy drinks than is healthy and/or sane. You can find more of his fevered scribblings and subversive, revolutionary tracts over at CultureWarReporters.com.. I think what many people miss is a focused tone. Everything you list and describe needs to suggest that your skills you used/acquired pertain to the next job you’re trying to get. If you really don’t have any relevant experience and must list out your jobs you took to get you by, you’ll have to think long and hard about how you can describe it in a way that makes it somewhat relevant, otherwise it’s not even worth putting in there. I’ve read resumes where it was like reading an essay where each paragraph was about a completely different topic; your resume should not be like this! I highly recommend downloading/purchasing some PDF books regarding the subject of writing resumes and cover letters. I graduated 2 years ago, and though I had about 1.5 years of internship experience coming out of school, I didn’t really hear back for most jobs until I fixed up my resume/CL according to the tips and tricks that books like “How to Write Killer Cover Letters” recommended. These books helped condense my resume/CL and made it stand out. I won’t mention any specific tricks they recommend (there are a lot), but here is what worked for me: they give you about 20-30 sample resumes to choose from….simply choose the best aspects of each sample that you like and incorporate it within your resume. That’s it. I chose a combination that made my resume look polished and still stood out. Ditto for my cover letter. 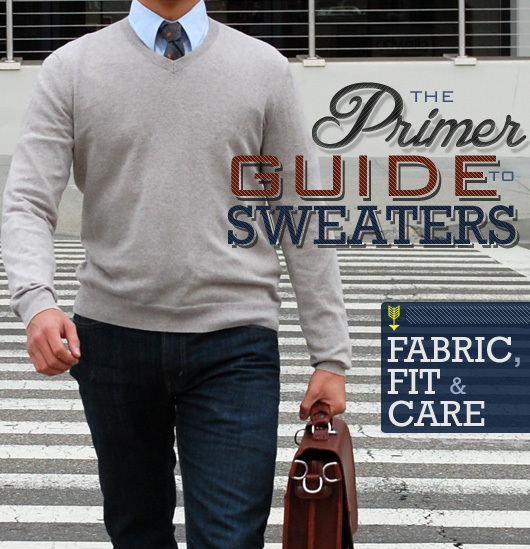 Its not just about the style either – HOW you say things and make it eye-popping within the text also matters. All you need to do is find a sample that works for you. Your resume will take some time to work on, if you want to make it stand out. I spent maybe 3-4 days reading books and incorporating suggestions before finalizing my resume. I would actually focus just as much on writing personalized cover letters (as in, make them easily modifiable) as I would on the resumes. Unless you are applying for a position where HR screens via a computer (in which case, the job is almost impossible to get without an “in” anyway), I will say that almost all managers that hire directly will read your CL and resume top to bottom so do more than the average graduate and read up on this stuff. Personalizing the resume for each application, or at least the ones in which you are really interested, is definitely a good idea. This advice forgets the fact that the applicant’s time is as much a capital as the white space on the resume. If we assume eight hours of active job-hunting a day and a 1% interview rate — in my experience, not bad benchmarks — then the amount of jobs an applicant has to apply to to average an interview a week is 100. Decant that over the business week (5 days), and you need to apply to 20 jobs a day, about 25 minutes per application. A fully personalized resume takes about 3-6 job slots to prepare. So unless full resume personalization jumps the lead generation rate up beyond 25% — again, in my personal experience, unlikely — the loss of time capital does not make up for per-position resume optimization. Except you are forgetting to favor in the quality of the job applied for. If you gain in any factor: salary, location, or quality of job, which a focused application improves then you are benefiting in the long run. Not to mention that unemployed time has no value. The point I was making is time is a finite resource. You literally can’t craft a perfect application for every application when you need a high volume of applications to try and make the jobs racket work in your favor. Quality means diddly squat when you’ve literally run out of time. I disagree with your statement that unemployed time has no value. I could squander my time playing games or watching tv, that would make it less valuable. However, I believe time spent productively always has value. Like Steve S. states, time is a finite resource, how you spend each minute determines its value. Nice blog post ! I was enlightened by the details ! Does anyone know where my company might be able to acquire a sample WV Official Abstract & Bibliography Pages form to complete ? Useful article – I loved the facts , Does anyone know if I could locate a fillable a form document to work with ? Your cell phone's dead, and you have to get somewhere in an unfamiliar place? As long as you know which direction you need to head, your watch will point you the way.